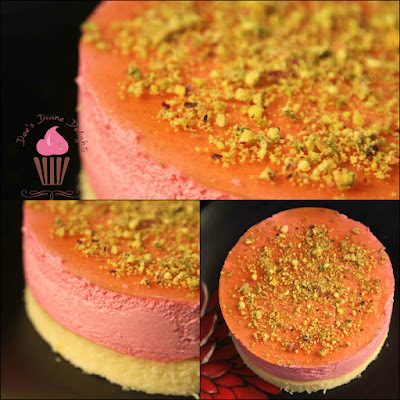 This entremet is arranged preferably in a cake ring and consists of a sponge cake base soaked in Honey syrup. 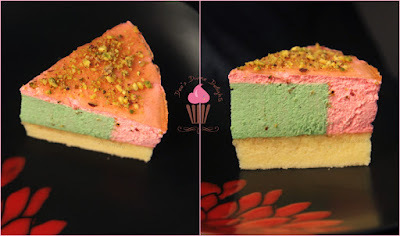 The pistachio mousse is set separately and placed on it. 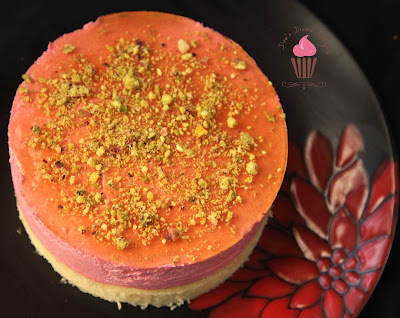 After which the rose Bavarian cream is poured on top and set in the fridge and topped off with the honey glaze. 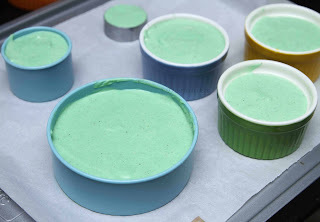 I made the Pistachio mousse the 1stday and let it set overnight. On the 2nd day, I went ahead with the rest of the recipe. 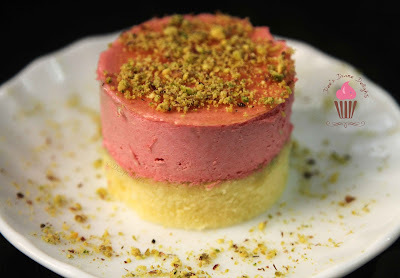 Just a point to remember-The mousse should be set in cake rings that are smaller than the size of your final dessert. I don’t have cake rings, so I have made entremets of various sizes using a few of my cookie cutters and in a small 6inch cake pan with a removable base, lined with acetate sheets. 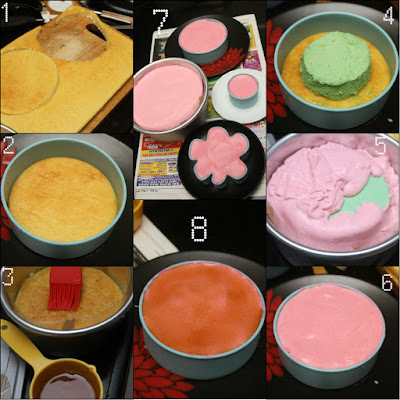 You can also set it in various sizes of cutters if you prefer or don’t own cake rings. Let’s get on with it then..
Cook this mixture on the stove in low heat, whisking constantly, until the mixture thickens and coats the back of a spoon. This will take around 5-7 mins. Do not at any cost, leave the saucepan unattended on the stove top. 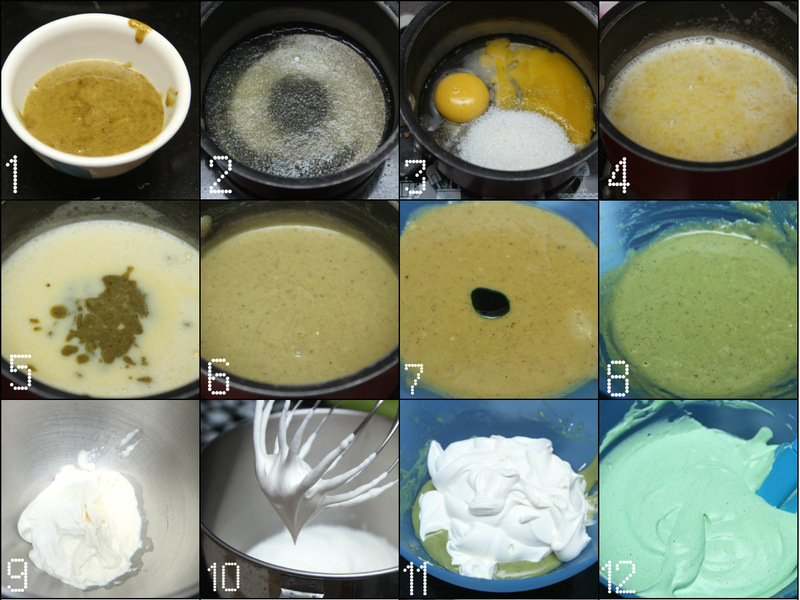 The egg will cook and form lumps in the custard. Pour this mixture into small cake rings and set it in the fridge, preferably overnight. Preheat your oven to 180*C and line a jelly pan or a swiss roll pan with baking paper. 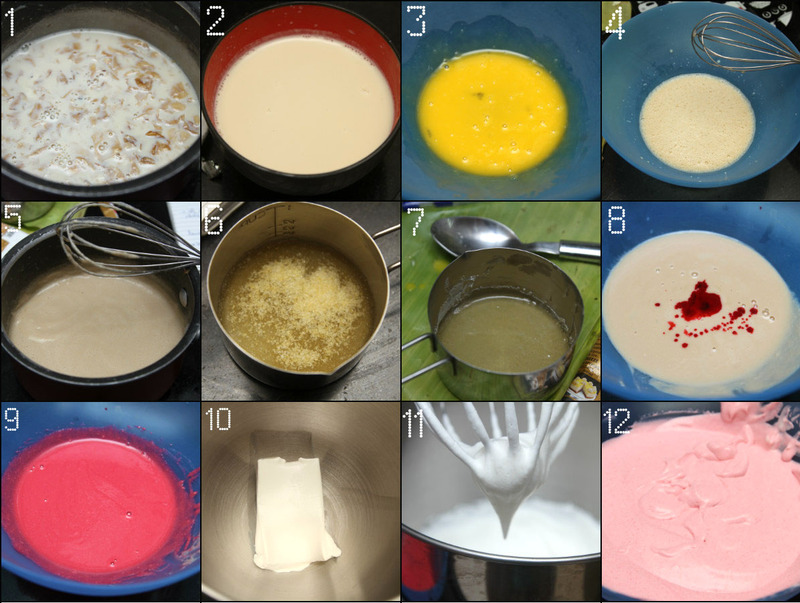 In a saucepan, heat the milk along with the Gulkand. Immediately after it comes to a boil, switch off the stove and let it sit for a while. Strain the milk and heat it again if required, we want the milk warm, neither hot nor lukewarm. Dissolve the sugar in the milk. In a bowl whisk the egg yolks lightly. Gradually pour the warm milk into the egg yolks, whisking constantly. 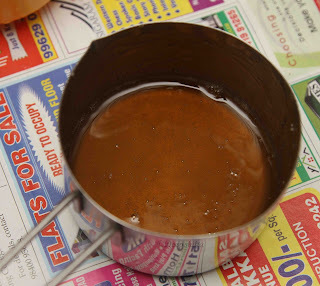 Transfer this back into the saucepan, and heat the mixture in low heat until thickened and coats the back of a spoon. Soak the gelatin in a tablespoon of water and melt it in the microwave. Stir it into the custard and mix well. Stir in the rose essence or pink food coloring if required. The gulkand doesn’t really give a pink color, so if you wish you can add coloring. It’s purely optional. Bring it to room temperature in a ice bath. Whip up the Heavy cream to soft peaks in a bowl chilled in the refrigerator or in the bowl of your stand mixer. 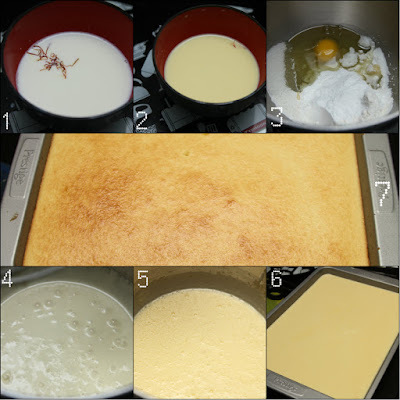 Fold whipped cream into the cooled custard or if you are running low on time, you can cool the custard in an ice bath and fold in the cream. 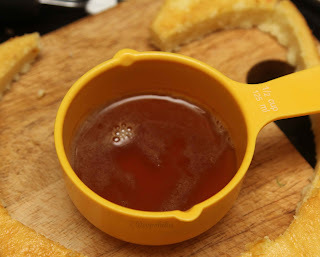 Heat the honey and water in a saucepan and bring it to a boil and keep it on heat for 2 mins. Switch the stove off and let it cool to room temp. Sprinkle the gelatine in 1 Tblsp of water and set aside for a couple of mins. Let it bloom and then melt it in the microwave. Mix the honey and 1 Tblsp of water. Add the melted gelatine and mix well. Keep it back in the fridge for 15 mins. Carefully unmould and serve immediately, chilled. 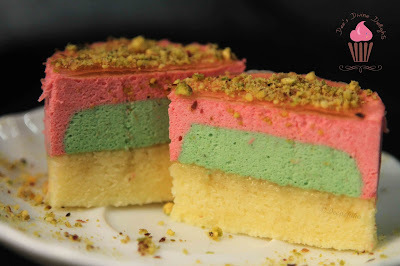 You can garnish it with crushed pistachios for crunchiness. 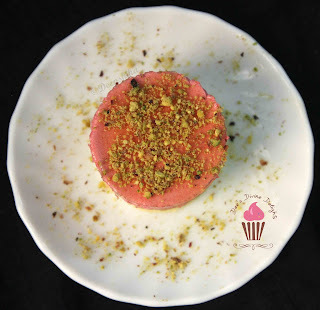 My verdict- The gulkand gives such a subtle yet lingering rose flavour to the Bavarian cream and combined with the whipped cream, it’s so soft and light! 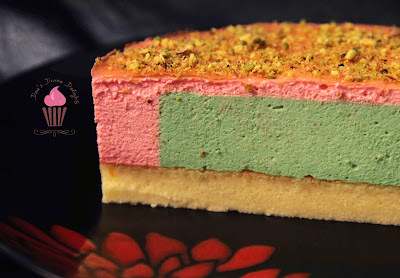 The pistachio mousse just blew my taste buds, I loved it. Maybe the addition of the pistachio essence took it to the next level. The honey syrup soaked sponge cake brought the whole thing together. 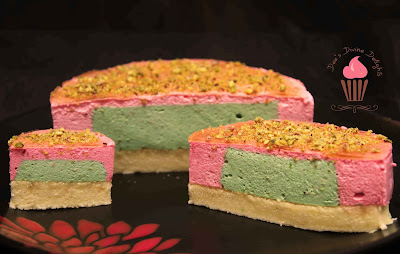 Though not a unique combination in Indian sweets, I am glad it worked sooo well in a French dessert. Such a beautiful entremet! Love the burst of flavours! The flavour profile sounds too good! Beautiful colours! Kudos Deep!